If you have never heard of Dosa, don’t worry, you are not alone. A year ago, I had never heard of it either. As my Instagram feed became more and more populated with a long kind of crepe rolled loosely with both ends touching one another like a piece of paper would I decided to do what most of us would have done: take my phone, open my browser and Google “what is a dosa?”. One year after, here I am, a Dosa enthusiast. (To be honest, I really like all kind of exotic food). 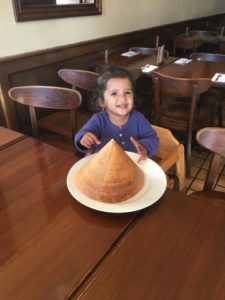 I decided to write about Dosa and share this article with the first restaurant where I ever tried Dosa, Davie Dosa Company on Davie St in the heart of downtown Vancouver, Canada. Let me tell you a bit about Dosas. Originally from the Southeastern parts of India, Dosa was originally called Dosai in the Tamil language. In India, Dosa is consumed as a breakfast even though most restaurants in North America serve it for lunch or dinner. Surprised? Well, did you know that Samosas are also mainly consumed for breakfast and as snacks in India? While I was in India crawling the streets of Old Dehli taking pictures, I could see Indian workers, lifters, drivers, cleaners, shop owners having early breakfast with Samosas. I tried it myself for 15 roupies ($30 cents) thinking that it is cheap enough for 1, but I got two. Can you imagine two samosas for 30 cents (Canadian dollars)? They were delicious with a spicy kick I will never forget. So, What is a Dosa? In my own words this is how I would describe Dosas: “Imagine a flavourful filling, wrapped in a soft and crispy Indian-style crepe”. The outside of the Dosa, the crepe is soft and crispy at the same time. The special batter Dosas chef’s make is truly a thing. You can shred parts of the Dosa and taste it without knowing what you are actually eating. It is just delicious and makes you want to keep on eating the whole thing just like an authentic French baguette just out of the oven would make you feel. That’s not it, Dosas are special because of what is inside. Usually, a delicious filling made of vegetable, starch and sometimes meat. Let’s now talk about the ingredients use in Dosas. What are Dosa made of? Dosas are like India, a mix of culture, food and origins that makes India what it is today. Dosas are a bit similar as they are made of a rice and lentil batter (best of both worlds) which make Dosas 100% gluten and nut free. What is in the Dosa? The most simple and traditional Dosas are called Masala Dosas. They are filled with a mix of potato, onion and spices including cumin, mustard seeds, turmeric. This is how most Dosas are eaten in India. However, there are many kinds of Dosas. The most modern Dosas reflect the taste of North American customers such as Butter chicken dosa or Cajun chicken dosa. The crepe is the outside of the Dosa, the filling is the inside of the Dosa. Time to discuss about what comes on the side of the Dosa. What are Dosas served with? Indian cuisine is a cuisine of contraction. Indians like to gather flavours that challenge each others or rather than complement like European cuisine would. Therefore, it is natural that a crepe made with rice and lentil is served with something sweet or savoury. This is why Dosas usually come with homemade sambhar, as well as a coconut chutney and a tomato chutney. Note: Sambhar is an Indian soup mainly made of lentils and veggies such as tomatoes and greens. Chutney is a type of sauce made of a main fruit or veggie (such as coconut, mint or tomato and an array of spices). Generally not. I have never tried a spicy (hot) Dosa. Not that I would mind, I just don’t think that’s a thing. Dosa are flavourful, might have a spicy kick but it would never challenging. Ask the chef, maybe they can make a special one for you. What should you drink with Dosas? If you want to keep it simple, Dosas can be tasted with a glass of water. But, I personally like to have a Dosa with a light beer such as a lager or a glass of white wine. Is there a season to eat Dosas? Dosas can be eaten all year long. Cold, hot, rainy or grey, Dosa everyday. Why not? 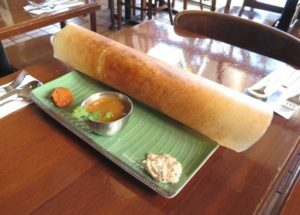 Dosas can be ordered for take-out even though it won’t be the same experience than in the restaurant compare to take-out as it Dosa is folded once on the left, and once on the right over the filling. How should you eat Dosas? As you want! 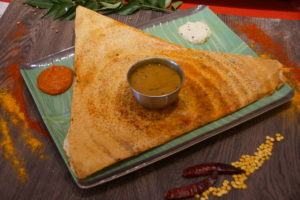 While most people eat Dosas with their hands, don’t feel ashamed if you want to savour Dosas one bite at the time by using a fork and a knife. Hey, If I go to an Italian restaurant and get a nice pizza, (not talking about pizza by the slice here) I would definitely use my fork and knife to cut it. Actually, even if I order a nice looking burger with fine ingredients, I would cut the burger in 4. Bottom line, eat you dosa like you feel ike it. 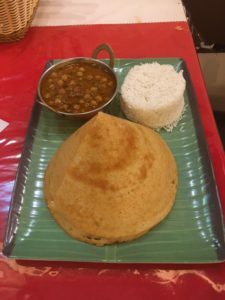 Your first time may be a bit easy especially because it is a bit hard to know exactly how much of the Dosa you can eat with the feeling but don’t worry you will soon learn how to do so. 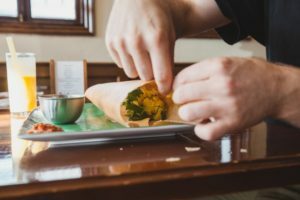 In a city like Vancouver Dosas generally cost from 10 to 18. Obviously, veggie dosas are cheaper while Dosas with meat filling are more expensive. How to make dosa at home? Good question! 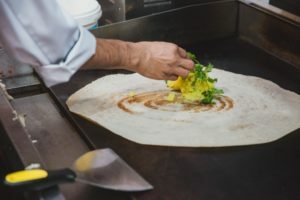 Cooks in Indian restaurants serving Dosas are masters. They are a bit what Japanese chefs are to Japanese Sashimi. Try, create your batter like you would for crepes or pancakes, heat up your pan and share your pictures with Davie Dosa Company on Instagram 🙂 You may be the next big thing. I hope this story made you want to try a Dosa. If it did, please give it a try at Davie Dosa Company. The chef, the staff, the food, the location, everything is amazing. Hope you can try it for yourself.